I once read a novel by Kingsley Amis in which he speculated that the rich stay that way by using whatever means they can to avoid spending their own money. It now transpires that Labour MP, Shaun Woodward, is a big fan of this method. Today's Observer reports that Mr. Woodward is a multi-millionaire by marriage, and owns a 'Wren-style pile in rural Oxfordshire, complete with organic farm', a home in the Hamptons, summer playground of New York's wealthiest families as well as a £55,000 modest redbrick terrace, bought without a mortgage in his St. Helen's constituency. Despite all of this wealth Mr. Woodward claimed £20,092 - to the penny, the maximum allowed by Commons authorities - in the last recorded year in 'additional costs allowance', the fund designed to allow MPs to maintain a second home so that they can carry out their parliamentary duties between constituency and Westminster. His claim for 2004-5 was his largest, but over the past four years he has claimed £71,719. Even more surprisingly, the money does not go towards his constituency home in St Helens - a modest redbrick terrace bought without a mortgage for only £55,000 - but to his rather more expensive apartment on London's fashionable South Bank. Woodward counts his main residence not as that in his constituency, but his family home in Oxfordshire, where he used to hold the seat of Witney as a Tory before crossing the floor. There is no suggestion that Woodward has broken Commons rules, which allow MPs to stipulate whichever home they wish to fund via the allowance. But the revelations will trigger calls for reform of the expenses system, which allows MPs to claim back not just mortgage payments on their second homes or even utility bills, but expenses ranging from food bills to buying new fridges or microwaves, and redecoration. Receipts are required for anything more than £250, except food. Just in case anybody reading this blog might think that the BNP are an acceptable protest vote then perhaps today's article in the Wales on Sunday might put them right. It is reported that British National Party chief, Nick Griffin, has been accused of making a joke out of the Holocaust by naming two pet pigs Anne and Frank. A BNP spokesman said the pigs, which had since been slaughtered and eaten by Mr Griffin, had been given "good old-fashioned English names" and only "nutters" would be offended. Asking "Who the hell is Anne Frank? ", he added: "I've got an uncle called Frank. Do you find that offensive as well? Are you mad?" When told about the 15-year-old girl, who hid out from the Nazis in Amsterdam before being sent to Belsen, where she perished a month before the liberation by British troops, he asked: "What's that got to do with the country today?" Then, he raged: "It's ***** like you trying to make something out of it. It's got nothing to do with the political scene today. F*** off." These people are mindless thugs. They deserve to be humiliated at the polls on Thursday. Today's Guardian reports that a new 146 government guide for immigrants containing a breakdown of all matters of British culture, history and tradition is in fact leading would-be citizens astray with a confusing array of historical errors, questionable suppositions and glaring misquotes. Claim: Describing the fighter pilots in the second world war, Winston Churchill said: "Never in the course of human conflict have so many owed so much to so few." Fact: He actually said: "Never in the field of human conflict was so much owed by so many to so few." Claim: Queen Mary "came to the throne with Spanish support". Fact: The United Kingdom includes Northern Ireland, the Channel Islands, and the Isle of Man. Great Britain is made up of England, Wales and Scotland. If this is the level and depth of knowledge that is required to be a British citizen then I can see a lot of people born, bred and educated here failing the test. This news is not going to play well with environmentally-aware voters. Apparently, whilst David Cameron is cycling from his home to Westminster, a chauffeur-driven Lexus is following behind with his shoes and papers. Perhaps Labour need to amend their Dave the Chameleon website. I have a really busy schedule today so I thought I would take a few minutes early on to write about some of the quirks of travelling in Malta. Anybody who has been here can testify to the fact that many of the roads have seen better days. I took a service bus into Valletta yesterday and really had my eyes opened. The buses here are old style single deckers, possibly dating back to the 1960s. The drivers completely dominate the road. As a result we travelled at great speed through narrow terraced chicane-style streets, bouncing over potholes, cutting up other drivers at junctions and roundabouts and even, at one stage, jumping a red light. This is not to denigrate Maltese bus drivers as everybody here drives in the same way. The other quirk of Maltese life is car parking. Parking spaces are a scarce resource. As a result people leave their cars where they can, even if it means blocking others in. So as not to be anti-social they all leave their cars unlocked and the keys in the ignition. Thus if you need to get out you simply move the offending vehicle. This has led to situations where drivers have had to move up to a dozen other cars to be able to get out of their parking space. Clearly, car theft is not a problem here. Finding where your car has been moved to after a couple of hours shopping is. I have just found the facility provided for delegates here, that enables us to have unlimited internet access without having to pay an extortionate sum of money to the hotel. As a result I have spent the last few hours catching up on news and other blogs. Honestly, you go away for a few days and all hell breaks loose. The Home Secretary allows 1,000 plus foreign prisioners to roam free when they should have been deported, Prescott admits to an affair with his secretary, Patricia Hewitt is shouted down by nurses, Neil Kinnock is banned from driving and of course Labour face a double test in Blaenau Gwent, having already alienated local people by seeking to call the election before Peter Law's funeral. On top of all that the Western Mail reports a row within Plaid Cymru over the selection of list candidates for my region of South Wales West and Peter Hain is proved to be wrong once again in his accusations about the conduct of Regional Assembly Members. The Assembly Government has confirmed that it holds no evidence that regional list AMs were abusing their positions and Hain has not responded to requests to back up his claims. Just for the record Peter Hain even gets it wrong in his comments in the Western Mail article. He alleges that 15 of the 20 regional list members have offices in constituencies where they were previously defeated. Actually, it is 14 but what is one constituency office between friends? Oh yes, and the latest poll shows plummeting support for both Labour and the Conservatives, with the net beneficiaries being the Liberal Democrats. A Mori poll puts Labour on 30% (down 9) the Tories on 30% (down 4) and the Liberal Democrats on 25% (up 5). A Guardian/ICM poll on Monday had the Tories on 34% (no change), Labour on 32% (down 5) and the Liberal Democrats on 24% (up 3). There is a definite pattern emerging here. So what exactly is going on here? An anonymous e-mail was sent to the Western Mail claiming that Assembly Members, Huw Lewis and Lynne Neagle, who are married with a three year old child, used their allowances to move from the deprived Butetown area of Cardiff to leafy Penarth, so as to put their son into a better school. Every AM who has his or her main home outside of Cardiff and Newport is entitled to draw down a £12,000 a year allowance for accomodation. A large number have used the money to buy or rent property. I have not, as I believe that Swansea to Cardiff is commutable and therefore I cannot justify the expense. When I need to stay over then I use a local hotel. However, this is the first time that I can recall that anybody has been accused of using the allowance in this way. The question is who would have had this information? Has it come from people within the Labour Party or has somebody else stumbled upon it and used it? We have also had this week a press release from a Labour Assembly Member, attacking the Deputy Presiding Officer for using his allowances to carry out a fact-finding trip to Gibraltar. I am sure that the two are not related but if we are to endure this sort of personalised, dirt-digging for the next 12 months then it will not just be the politicians who will suffer but the Assembly and the political process itself. Wales is a grossly unequal society - you see it so clearly when you represent a constituency like mine. Unequal not just in terms of personal prosperity, but also in terms of access to public services and the stepping stones they offer to opportunity and a more fulfilled life. The Maltese really excelled last night. After a long day debating the future of the European Community in the presence of the European Commission Representative to Malta, they bussed us into Valletta for a dinner in our honour. The coach stopped a few hundred yards short of the venue so we got out to walk through residential streets behind a brass band. On arriving at we were met by a bugler and drummer in traditional dress. There is no doubt that, having been recently admitted as a full member of the EEC, Malta are determined to make their mark and are using their existing contacts and networks within the Mediterranean and in the Commonwealth to do so. Already they are punching above their weight in my view. Judging by reports in today's Western Mail, Labour seem determined to lose the Blaenau Gwent by-election before it has even been called. Their crassness in seeking to have the writ moved before Peter Law's funeral has upset a lot of people and will reinforce the view in that area that they are still being taken for granted by the Government party. Labour may have abandoned the all-women shortlist that led to the loss of the seat in the first place but it was not just that which led to Peter Law's spectacular victory last year. It was a feeling that the Labour Party was behaving in an insensitive and arrogant way towards the constituency and its electors. If this latest news is true then they do not seem to have learnt much at all. I am told that this month's Vanity Fair 'Green Issue' is required reading for Cameron's Tories. Tucked away in a section entitled 'Looking smart and doing your part' are instructions on the eco-friendly way to wash cashmere. It was with great sadness and regret that I learnt of the death of Peter Law this morning. His contribution to Welsh political life and to his own community has been immense and he will be greatly missed. He was a principled and courageous man and a politician with great generosity of spirit. I had the utmost respect for him and for the way that he fought so hard for his constituents and his beliefs. The Welsh Assembly will be much the poorer for his passing. Apparently, it is a week of fireworks here in Malta. Alas, being some distance from the capital we can hear them but not see them. Walking out of the hotel in Attard last night on our way to the Presidential Palace for a reception, the noise was overwhelming. It was as if a small war was being waged. Yet, we were unable to enjoy the compensation of actually witnessing the show. Much of the Commonwealth Parliamentary Association Conference so far has centred around peace and security in the Europe and in particular, the Mediterranean. There was an interesting contribution this morning from one guest speaker discussing demographic changes in the Mediterranean region. It seems that the previous population mix of one third Middle Eastern/North African and two thirds European has been reversed in recent years. This has caused tension and misunderstanding, often leading to conflict. In that short passage I have massively oversimplified the argument but it was a thought-provoking point nevertheless and indicates the need for more tolerance if we are to resolve complex areas of conflict in this region. Today's Western Mail reports that the Welsh Conservatives are having their usual problems with women. The candidates in all seven of the party's target Welsh seats next year are men, and men also dominate the PR list seats selected last week. Senior party figures in Cardiff and Westminster were hoping a publicity drive would help attract more women and ethnic minority candidates for next year's Assembly elections. However, key target seats like Cardiff North, Clwyd West and the Vale of Glamorgan will be fought by male candidates, as will the safe seat of Monmouth, where sitting AM David Davies is standing down to concentrate on his role as the area's MP. And last week saw four of the five regional top-up lists pick their candidates, with all but one picking men in the most winnable first two slots. Only Laura Anne Jones, in South Wales East, has made it to a number two slot on the list, and she is already an AM. Although there are women in the number three slots in North Wales and South Wales Central, without a huge swing to the Tories at the ballot box they are unlikely to be returned to Cardiff Bay. The Tory leadership is finding it difficult to influence the local associations, who pick the constituency candidates. So much for David Cameron's brave new world. I have commented before on the draft guidance currently out to consultation on appropriate behaviour when teaching drama in schools. However, an article in the Pendennis column of yesterday's Observer has broached this subject once more. They report that Melvyn Bragg has booked outspoken playwright, Mark Ravenhill, for the South Bank Show's forthcoming edition about Romeo and Juliet. Apparently, Mr. Ravenhill feels strongly that the alleged ban on kissing in Welsh schools is rubbish. "'The idea that Romeo cannot kiss Juliet makes a mockery of drama' says a source at the SBS. 'He'll go round schools encouraging plenty of kissing - boys with boys, girls with girls...'"
Putting aside the fact that both Melvyn Bragg and Mark Ravenhill have got completely the wrong end of the stick and that the proposed guidance would not ban kissing in a production of Romeo and Juliet, do either of them really want to go down this road? This guidance was drafted in response to an inquiry which investigated a drama teacher who misused his position to abuse children for his own sexual gratification over a sustained period of time. It has all-party support in the Welsh Assembly and enables drama teachers to teach their subject in an appropriate manner, providing safeguards for the protection of the children whilst not compromising artistic integrity. The South Bank Show can have its fun if it wishes but in doing so the programme's producers should be aware that they are campaigning to keep open a loophole, which has already been exploited by one child abuser and may be exploited by others. Surely, even they can see that this is not a responsible position to take and that some more research is necessary to get their facts right before they do irreparable damage, which will blight the lives of many children for years to come. There is something strangely poetic about flying to the George Cross Island on St. George's Day. On the occasion of the Queen’s 80th birthday we should acknowledge her achievements as the Head of State. She has succeeded in fulfilling her constitutional duties from a position of interested and involved neutrality and has used her role to promote Britain and British interests on the world stage to great effect. It is only right though that we look to the future. The vast majority of people retire at 60 or 65; it is time that Elizabeth Windsor passed on the baton as well. Who or what takes her place though is another question. Prince Charles has already declared himself as a political dissident. That is not a role he will be able to pursue as Monarch. The British constitution is moving forward. We have regional government in the form of the Welsh Assembly, the Scottish Parliament and the Northern Ireland Assembly. The emphasis is on devolving power, on giving people more control of their own destiny. The House of Lords has become a largely appointed institution, with the hereditary peers effectively sidelined and disenfranchised. It is likely that we will soon be moving to an elected second chamber, in which the ability to lend money to the governing parties of the day ceases to be a factor in one’s eligibility for membership. The idea that somebody can inherit great influence and wealth by virtue of their birth and use it to act as an arbitrator on the political process is no longer relevant or desirable. The logic of the present reforms is that the Head of State must be democratically accountable in much the same way as he or she is in the vast majority of the World’s democracies. In accepting that principle we also accept that the role of Head of State must change as well. This is a position that can be filled by a political dissident such as Prince Charles, simply because an elected President will have democratic legitimacy and thus be able to lead a broad debate on values. An elected Head of State could use their powers without fear of provoking a constitutional crisis. He or she would also act in a representative and ceremonial role as now, but with the authority of a democratic mandate and without the excessive cost of today’s monarchy. The case for change is overwhelming. We should not let sentiment prevent us making it. The BBC report that cracks have appeared for a second time in the oak desks used by AMs in the Senedd debating chamber. Apparently, six of the desks are suffering from cracks in the wood. It would be nice to report that this cracking was as a result of members pounding the woodwork as part of a passionate debate on the burning issues of the day, but alas that is not the case. Still, at least it is not going to cost the public purse anything to fix as we are still under guarantee. I was quite amused by the very defensive comments of Maureen Kelly Owen, a past president of Royal Society of Architects in Wales. She told the BBC that the desks difficulty was typical of the "teething problems" any large, design-led building could expect. She said: "You could build an unadventurous, cavity-wall building, totally unexciting and lacking in innovation, and you would get one that would never leak, and never move, but it would be so dead boring that architecture would never move on." My experience is that even unadventurous, cavity-wall buildings have teething problems when they are first built. Even old buildings have 'issues'. I live in an early twentieth century terraced house which is developing cracks in the plaster due to the movement of the roof when the wind blows. This latest problem with the Senedd is nothing to do with the architecture but with the quality of the workmanship. Is she really saying that if you experiment and build adventurous and innovative buildings then you are going to suffer from leaks and other problems? Perhaps, Ms Owen should stop digging now. As blogging is going to be light for the next week due to the fact that I am representing the Welsh Assembly at a Commonwealth Parliamentary Association Conference, I thought I would provide a picture caption competition to keep you all occupied. The story behind the photograph is that Welsh Liberal Democrat AMs and MPs were in Edinburgh at one of our regular strategy meetings and were also using the opportunity to touch base with Liberal Democrat MSPs. I was not present due to a family funeral. 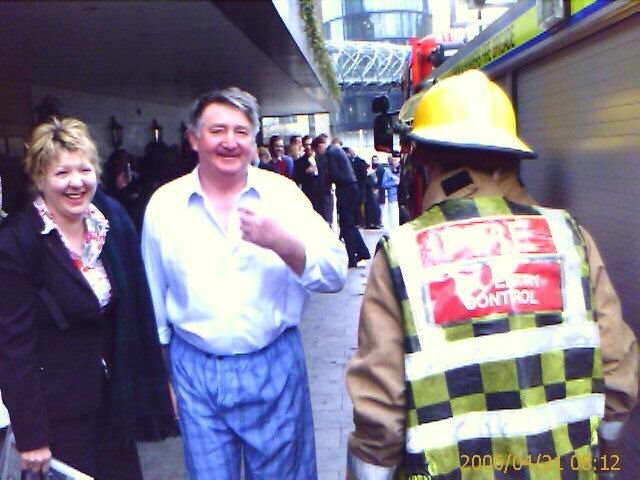 Apparently, there was a fire alarm in their hotel this morning causing a mass evacuation. The photograph features the Liberal Democrat MP for Brecon and Radnorshire, Roger Williams, in his pyjamas, being cheered up by North Wales Regional AM, Eleanor Burnham. Please use the comments section for suggested captions. The news that an Ashes cricket Test match will be played in Cardiff in 2009 has not gone down too well in England, where a number of people seem to think that the existence of the Welsh Assembly has given us an unfair advantage in the bidding war. Nevertheless, I think I can safely predict that seats at next month's Council planning committee meeting will be very rare indeed. Will we see ticket touts outside of Cardiff County Hall? We will have to wait and see. Thanks to Guido Fawkes and Iain Dale for drawing my attention to this rather good re-working of Labour's Dave the Chameleon PPB. Beware, it is a big file and will take some time to download. So far, so predictable. The House of Lords last night voted by a majority of 19 to continue the current system whereby candidates can stand for the Assembly in both constituency and regional lists. Peter Hain has insisted that he will push through the rule-change regardless. This no longer affects me as I have already made the commitment to stand on the Regional List only, though if I am allowed there may be circumstances whereby I will put my name forward for a constituency as well, if only to use the opportunity to increase the Welsh Liberal Democrat list vote. It is a shame that the Lords amendment was so tame in opting for the status quo rather than an all-out system of STV to elect all 60 Assembly Members. At least then there might be a real challenge for the Government to deal with. Instead we get stale Labour gerrymandering versus a half-hearted defence of the status quo by the opposition parties. And whilst all of this is going on we have our attention and vital Parliamentary time distracted from the real issues in the bill, namely the transformation of the Secretary of State for Wales into a provincial viceroy and the failure to address public demand for full legislative powers for the Assembly as envisaged by the Richard Commission. Labour will regret supporting this Bill if the Tories get back into power in Westminster. As clever as Labour's Dave the Chameleon campaign is, I cannot work out who they are speaking to or why. It seems to me that the message will have most resonance with politicians, so maybe the objective is to undermine Cameron within his own party. Most ordinary people will just shrug their shoulders and say that this is how they have always viewed politicians anyway and nobody ever thought that the Tory leader was any different. More damagingly, the more I look at the advert the more the central character looks like Tony Blair. The article quotes Dennis Kavanagh, professor in politics at Liverpool University and an expert on political communications, as saying that adverts work when they go with the grain, when they work with something that already exists. He believes that this is true of the chameleon campaign as well, but there has to be another factor, there has to be a message that people recognise and are prepared to associate themselves with. At best the message in this case will just goes over the heads of the majority of voters, at worst it will reinforce people's negative views about the Blair Government and politicians in general. We will see. For sale, 20 year old Jaguar. One careful owner. At last some publicity for the Liberal Democrats even if it is just to report that Ming Campbell has put his Jaguar car up for sale. Self-sacrifice is becoming quite fashionable as a means of highlighting one's commitment to important political principles. First, we had the Liberal Democrat Shadow School Minister, Greg Mulholland, returning his baby daughter Isabel's Child Trust Fund cheque for £250 to the Chancellor, Gordon Brown, with a request that he invest it in reducing class sizes instead, now we have Ming underlining his personal commitment to environmental sustainability. Ming will also be taking the tube when travelling around London rather than using a car. The old adage that we reap what we sow must surely have hit home with Margaret Hodge by now. Her selfless promotion of the BNP has led to a media storm in which the BBC and normally sane newspapers are predicting that the right-wing party could win up to a fifth of all votes cast in the local English Council elections in two weeks time. Nothing is more likely to produce that outcome than the credibility given to Nick Griffin's candidates by Labour Ministers such as Mrs. Hodge and Phil Woolas and the subsequent talking-up of the BNP by newspapers such as the Daily Mail. The only saving grace in all of this is that the BNP are not fielding enough candidates to be able to secure the percentage vote that is being mooted for them. One can only hope too that the voters have too great a sense of decency to bring themselves to vote for policies such as 'the segregation of 'foreign pupils' and 'native English speakers' in schools and the use of asylum seekers to sweep the streets.' It is likely though that in areas such as Barking and Dagenham, where the Labour Party has lost all credibility with its core supporters and there are no other clear alternative candidates in many wards, the niceties of policy may not get in the way of a protest vote. I remain astonished at the sheer naivety and lack-of-understanding of senior Labour politicians at both the way the BNP operates and why people vote for them. If Margaret Hodge really wanted to demonstrate that she takes this threat seriously then she would have been better off showing some sorrow for the way that Labour have let her constituents down and talked about the issues they are raising with her. In doing so she might at least have had a chance of persuading those who want to vote BNP as a protest to stay at home. Instead she has reinforced the BNP's own rhetoric and earmarked them as a possible home for the disaffected. This is becoming a story about the cover-up rather than the killing itself. I hope that we do not forget in all of this fuss that there has to be some closure for the de Menezes family as well. I did not have much time for blogging yesterday due to family commitments so I put off writing about Margaret Hodge until today. In many ways that is fortunate as I am still having difficulty getting past my anger at her stupidity. I do not know if eight out of ten of voters in Barking and Dagenham were thinking of voting for the BNP before, but after this outburst it is almost certain that they are now. It seems that Mrs Hodge has been talking to her electors but not listening. If many of them are considering voting for the BNP then it is because they are disillusioned with the Labour Government and the local Council. The BNP may be racists but it is not racists who they appeal to. Instead, they latch onto dissatisfaction and apply a simplistic and popularist solution to local problems. Often this can involve finding scapegoats, in all cases it involves casting themselves as an anti-establishment force who local people can identify with. By placing them in the spotlight in this way, Margaret Hodge has given the BNP greater credibility and directed more people to a possible receptacle of their protest votes. She has also reinforced the voters' views of her party as one which is incapable of engaging with the issues. This is because she is talking about process rather than people's concerns and she is doing so in the BNP's language. Those concerns are not necessarily about race. Immigration and asylum are convenient hooks on which to hang the blame for poor and unavailable housing, unemployment, lack of educational achievement, anti-social behaviour and a whole raft of other problems, but it is those issues that need to be tackled not the changing ethnic mix of our society. If the Minister is serious about combating the BNP then she needs to start listening properly and to help people to find solutions to the matters that are really riling them and which cause them to look for alternative politicians. All she is doing at the moment is causing more damage to the fragile fabric of our democracy and in that she is not alone. The loans for peerages row is continuing to spin out of the control of Downing Street with further allegations in today's papers and with the police announcing that they are widening their enquiry next week. 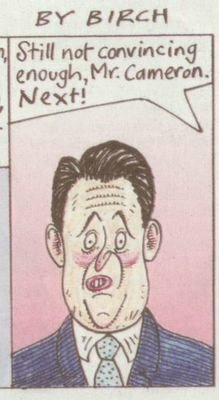 In today's Observer Downing Street sources have admitted that two donors to Tony Blair's flagship education policy project were nominated for peerages because of their support for academy schools. One such source "insisted the Prime Minister was entitled to select as political working peers those he wanted on Labour's side in such votes. Aides insist the row is based on suggestions Number 10 was trying to ennoble donors secretly when in fact the academy link was openly in the citations, adding that this would not stop academy sponsors being nominated for the Lords in future." As true as this is, the problem is not that Blair sought to put people in the House of Lords who have a political affinity with his agenda, but that those he chose were people who had made a substantial personal financial commitment to the academy programme. The Independent suggests that things can only get worse for both Labour and the Tories. They report that both parties could be made to forfeit millions of pounds in donations if the police cash-for-honours inquiry finds them guilty of breaking the law. Things could have been so different of course if the House of Commons had voted to democratise the upper House some years ago. Somebody, somewhere thinks that thespians should play a more prominent role in politics. 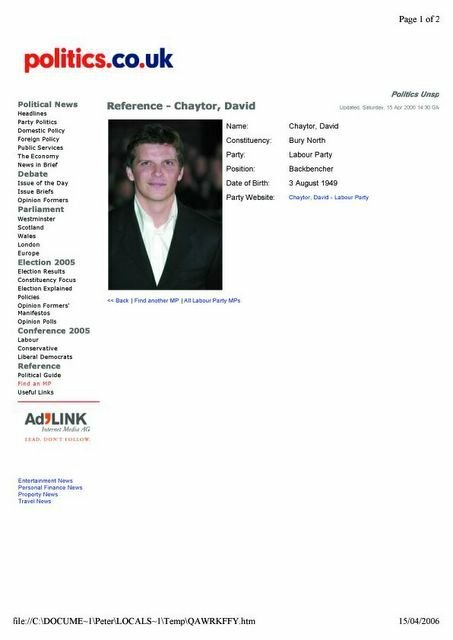 What other explanation could there be for Eastenders actor, Nigel Harman masquerading on the politics.co.uk site as Bury North Labour MP, David Chaytor. This is not the first time this has happened. Back in August 2005 I highlighted the fact that Islwyn MP, Don Touhig, was featured on the same site as a racehorse. That picture remains there to this day. The politics.co.uk strapline is 'politics unspun'. Perhaps the webmaster has become unpicked. By way of rebranding The Greatest Story Ever Told in shiny new colours, the cast - which includes both Keith Allen and Tim Booth, the former singer with one-time indie-rock monarchs James - will break up the dialogue by singing a selection of tunes by Manchester musicians. No matter that most of the material was conceived in rock'n'roll's traditionally irreligious spirit: the Last Supper will be marked by a mass rendition of Joy Division's Love Will Tear Us Apart, Judas Iscariot will duet with Jesus on a version of New Order's Blue Monday, and - for some reason or other - the trial of Pontius Pilate is to be based around Oasis's Wonderwall. Despite the fact that Robbie Williams is from Stoke-on-Trent, there will also be a rendition of Angels, but the producers aren't letting on any more than that. Let me say this, though: if it soundtracks the Ascension, we will officially be living in a world where the sacred has been so mixed with the mundane that Dr Rowan Williams may as well join the Ordinary Boys. One also wonders what song ideas were rejected: one last oration from Jesus to the strains of the Smiths' Stop Me If You've Heard This One Before? Christ grappling with the stone that blocked his tomb to the sound of Noel Gallagher's Roll With It? There again, the fact that Mary Magdalene is reportedly going to sing the Buzzcocks' Ever Fallen In Love (With Someone You Shouldn't've) proves that the whole business is largely beyond satire. Presumably, we will be getting a sequel on ascension day with the Stone Roses "I am the resurrection". Any more suggestions of suitable songs by Manchester bands welcome. Those who criticise the Assembly's Party list system are by and large right. It is a nasty hybrid that fails to advance accountability one iota. Even more damning it fails to do what it was designed for, namely to produce a proportional outcome to an Assembly election. That is because its New Labour architects could not help themselves. They stacked it in their own favour. The problem with those who criticise the Assembly's Party list system is that by-and-large they or their party were responsible for introducing it in the first place. It is Dr. Frankenstein and his monster. They created it but they are afraid of it and they cannot control it. However, instead of acknowledging this point and going back to the drawing board Labour choose instead to attack those who are elected on party lists rather than the system itself. The obvious alternative is to introduce elections under the single transferable vote system as advocated by the Richard Commission. This will retain the constituency link whilst ensuring that all AMs are considered as equals with the same responsibilities. That however is not on the table, simply because the critics are those who do not believe in proportional representation but prefer the old, unrepresentative first-past-the-post system. It is worth noting in passing that to suggest that because we are on a party list means that the voters do not actually elect us a false one. However, if people are going to make that accusation then they should at least be consistent and apply the argument to MEPs as well. They do not of course because Labour have two MEPs who would not take kindly to being branded in this way. One rule for the opposition and one rule for Labour does not make for an impartial and consistent case. It is no wonder that many have concluded that this whole issue is a partisan one and as such Labour's case has little merit. So what are the myths that regional Assembly Members have to contend with? Firstly, there is the allegation that we are not elected. This is patently untrue. All regional AMs appear on a party list on a ballot paper in the same way as MEPs. We need to secure sufficient votes to be returned to the Assembly in a separate election to that taking place for constituency members. Secondly, the myth that regional AMs do not do casework. Not only do I have a heavy casework load and employ a caseworker but I also do surgeries and encourage people from right across my region to come to me for help. Thirdly, the claim that list members have an ill-defined role. All Assembly Members are treated equally in the chamber and all of us have a right to participate on both national and local issues. As I treat my region as a giant constituency then I have more local issues than constituency members and arguably a need for more resources to support me. Because my work is shared by three other regional members then we accept that an equity of resources with constituency members is about right. Fourthly, our opponents say that we are immune to public opinion. No politician can afford this luxury. Quite apart from the fact that our party members form part of that public opinion and that we need to be reselected in the same way as a constituency AM, we are often the public face of our party in our region. We all have ambitions for our party and we all want to do better. Therefore it is important that we listen to people and take account of their concerns. Fifthly, Labour say that we campaign only in selected constituencies. This is simply not true. I have never concentrated all my resources on one constituency. I hold surgeries thoughout the region as can be evidenced here, I have my office in a different constituency to the one I contested in 1999 and 2003 and I campaign and undertake casework in all the areas I represent. Sixthly, some say that we have too much time on our hands. In particular I have been accused of this because I write this blog. Those who make this accusation obviously are incapable of time management. I am not. There are 168 hours in a week. I often work on all seven days and on average put in 70 plus hours as an Assembly Member each week. Like everybody else I have recreation time. Unlike others I do not always take it as big chunks, simply because my commitments do not allow it. Although it is recess I have spent the last few days at a number of meetings, doing casework, holding a surgery and talking to various local groups. This blog is a communication tool which I use to enable people to assess my views, to learn more about me and the Welsh Liberal Democrats and to comment if they wish. It is not there to make me accountable, that is what elections are for. But it does help with transparency and accountability. Seventhly, it is said that a regional AM cannot be defeated in an election. That is patently untrue. At the last election Plaid Cymru and Labour both lost regional seats. It is possible under the distorted d'hondt system we use for me to lose my seat if the Welsh Liberal Democrats won Swansea West for example. It is also possible for another opposition party to do well enough to take my seat off me and my party. Finally, it is said that if I do not like the system we use then why stand for it? I do not like the first-past-the-post system either but it is there and we have to use it to influence things and put our policies into effect. I have to get elected to change it. Simply, I believe that the Welsh Assembly is very important and has the potential to do great good. I believe that it has already achieved a lot. I am committed to devolution and to creating a liberal society where everybody has social justice. My work as an Assembly Member therefore is important to me and I shall continue to do it as long as my party and the electorate will let me. "A high court judge branded the government's system of control orders against terrorism suspects "an affront to justice" yesterday and ruled that they breached human rights laws. The ruling by Mr Justice Sullivan came after a challenge to the first control order issued against a British Muslim man, alleged by the security services and the home secretary to have been planning to travel to Iraq to fight UK and US forces." Will the New Labour Government now brand this judge as 'soft on terrorism'? We wait with bated breath. The Home Secretary has announced that he is to plough ahead with the merger of Police forces in England and Wales despite resistance from police authorities and local people. This resistance is especially strong in Wales where those in the north, mid and west especially, believe that merger will take away identity and accountability, whilst in the south those concerns are compounded by the fear of higher Council Taxes to pay for the reorganisation. It has been estimated that the cost of merger will be £50m across Wales but Charles Clarke now says that he will pay 100% of the "net start-up costs" and "reasonable revenue/resource and capital costs" whether or not forces had volunteered to merge. This is clearly a concession to get the proposal through Parliament but it does not address the issue of accountability. In fact it does not really deal with the question of who pays as it is unlikely that the Home Office will pick up all of the bill and most of the remainder will end up on Council tax demands. Just averaging out the current cost of Wales' four police forces leaves many areas with bigger bills because of the variation in precepts levied by each police authority. It is just not possible to get away from the thought that these proposals are being driven by cost-cutting and centralisation factors rather than a legitimate law and order agenda. Local police forces are best placed to provide policing. These reforms will mean communities will have less influence over the way their local police operate. This is not just an agenda which is being pursued by politicians. Last week we carried out a street referendum in Maesteg. Ninety Four per cent of those who took part were opposed to the merger in Wales. That is strong opposition by anybody's standards. I admit that I am notoriously impractical when it comes to DIY and household improvements. It may be that I do not have the knack or just that I am incapable of applying myself, but whatever I try never quite works out right. This article in the Western Mail therefore struck a chord. I can at least wire a plug though I recall that my first attempt at doing so was a bit of a disaster. I had just moved into a hall of residence at University only to find that all the electricity sockets took small round three pin plugs. I went out to the shop, bought some and put one onto my stereo. I plugged it in and promptly blew all the fuses on the fifth floor. The journalist reports that "nearly half of those under 30 would struggle to wallpaper a room, 44% could not bleed a radiator and 35% would not know how to unblock a drain. At the same time, 27% could not sew a hem and 26% do not know how to wire a plug, according to Direct Line Home Response 24 who commissioned a YouGov poll of 2,294 people in March. A fifth of young people said they had panicked when confronted with a household emergency, with many having to resort to calling out a professional." Direct Line has dubbed this group of people, the flat-pack generation - because their domestic skills end at being able to assemble flat pack furniture. I find this assertion to be astonishing. Who is it that says that assembling flat-pack furniture is straightforward? It is one of the most difficult and demanding DIY jobs around, and I have a number of wobbly bookcases and dodgy chest-of-drawers as testament to this. I truly am a lost cause when it comes to DIY. At the time of the flooding of the Cardiff Bay basin I was my Party's Welsh spokesperson on the Environment. I was appalled at the damage that the barrage did to this area and in particular the impact on the numbers of Redshank and Dunlin in the Bristol Channel. The scheme at the Gwent Levels is of course a mitigation measure and does not provide an alternative habitat for these birds. It is too late for this area, but not for the Severn Estuary. That is why Rhodri Morgan needs to get out of the mindset that the only way to harvest electricity out of the huge tidal range in the River Severn is to build a 10 mile concrete wall with a road across it. Such a course of action will completely undermine the Assembly's commitment to sustainability. It would have a devastating effect on local wildlife and the environment by destroying one of the UK's most important inter-tidal environments, providing food for more than 50,000 waterfowl. The First Minister is quoted as saying that the destruction of feeding grounds for birds is the "lesser of two evils" compared with the perils of greenhouse gases created by burning fossil fuels. If this was the choice facing us then he may be right, but it is not. It would be perfectly possible to generate as much electricity by building a series of tidal lagoons. They would not have as big an impact on the local wildlife and would be far more sustainable in every way. Let us hope that Rhodri finds a new scriptwriter and new advisors before he commits us to a project that would be an even bigger mistake than the Cardiff Bay Barrage. Personally, I have no problem with people who have something to offer and who have been rejected by the electorate being put in the House of Lords. After all that is the system. What I do have a problem with is the system itself. A revising chamber which is appointed on the basis of Prime Ministerial and party patronage is both anti-democratic and constitutionally dangerous. It is not a situation which can be allowed to prevail for much longer. There must be reform so that the vast majority of the second chamber is elected by some form of proportional representation for a fixed term. I also have a problem with hypocrisy. Welsh Labour wrongly condemn the Assembly list system as allowing politicians, who have been rejected at a constituency basis, to become AMs by the back door. At least regional Assembly Members have been voted in through a second election process. With Maggie Jones we have the case of a rejected politician entering the House of Lords on a party list without having to submit herself to the electorate again. It is one rule for the Labour Party and another rule for everybody else. These people are a threat to democracy because they believe that its principle objective is to maintain Labour in power. It is not. In many ways the defection of former Labour Assembly Member, Alison Halford, to the Conservatives has not really surprised me. Clearly, she prefers a centralised, authoritarian party to one such as the Liberal Democrats, which believes in empowering people. The reasons she gives for jumping from one sinking ship to another are instructive. Alison has spent her career speaking out against cronyism. It stands to reason therefore that the appointment of Peter Mandelson as a European Commissioner might have been the final straw for her, though what else did she expect? She may also have been uncomfortable at the loans for peerages scandal that has recently hit the Labour Party, though if that is her reason for moving she will want to reconcile her discomfort with the involvement of the Tories in the same game. Personally, I agree with the comment by North Wales Welsh Liberal Democrat AM, Eleanor Burnham. She said: "Alison Halford’s move to the Tories is further evidence of the blurring of the lines between the two old authoritarian parties. "With both parties occupying much of the same ground - supporting ID cards, school selection of pupils and the Iraq war before that – it’s little wonder that someone can move in and out with ease. "Alison may speculate whether it was really worth officially changing though. For far too long Labour have been the real conservative party in Wales; Holding the country back, trying to ‘bind people together’, a half-hearted support for devolution and a contented slumbering style of government." All in all, I remember Alison as a delightful, eccentric lady with a razor-sharp mind and a capacity for interrogation that left many Assembly witnesses floundering. She may have been better retiring gracefully and leaving us with those memories rather than lending her name to yet another dodgy cause. David Cameron is a pilot who can't get his undercarriage up. His leadership of the Tory party left the runway with impressive speed, considerable élan and a strong following wind from a friendly media. But now he is struggling to gain any altitude. I sniff the sweet smell of panic in the Tory leader's cockpit about what he and his modernisers can do before the right wingers in their party try to storm the pilot's cabin. You can see why they are getting a little frantic. David Cameron had a dream start, the most sun-blessed honeymoon a new Tory leader could ask for. To him was gifted a divided Labour party, an embarrassed Liberal Democrat party, a Conservative party willing him to be a success and a benign press drooling over his every photo-opportunity; his wife even provided a new baby to kiss. The electorate's negative feelings towards the Conservative party are too deeply embedded to be simply magicked away by David Cameron sporting his Converse trainers and saying he will stick a wind turbine on the roof of his new house. A revealing poll by ICM for Channel 4 News had well over half of the respondents agreeing with the proposition that Mr Cameron was a new face, but his party hadn't really changed at all. Mr Cameron was right to move quickly to change his party, but the very rapidity of what he has done is bound to breed questions in the mind of the sceptical public about the sincerity and depth of his modernisation of the Conservatives. When Tony Blair took over the Labour party, it had been set on a modernising trajectory for some years. He could locate his leadership in a narrative of change that had begun 11 years earlier with Neil Kinnock. What Labour took more than a decade to manage, David Cameron is trying to achieve in a much shorter time. The voters are understandably suspicious when a party tries to present itself as an overnight convert. Could it be though that David Cameron is not the messiah he is being made out to be? People I have spoken to, who have no record of political involvement other than their dedication to voting, think that he is a carbon-copy of Tony Blair. Most of them do not trust or like Blair anymore, but will stick with him rather than take a risk on a political look-a-like who they do not know and who has no track-record. Cameron's weakness is not his flip-flopping, it is that people do not trust him precisely because he has set out to mould himself and his party into something that neither are. In these circumstances, a principled and well-led Liberal Democrat party has everything to play for. David Cameron has already discovered how difficult it is to change the direction of a political party. His attempts to remould the Conservatives into a more modern and relevant political force have consistently floundered on the rocks of member willfulness, as they continue to select non-PC candidates and act as if their party was still led by Margaret Thatcher and Norman Tebbit. Now the BNP have hit the same ceiling, with members in open revolt at attempts by their leader, Nick Griffin, to widen their membership base. In 2004 Mr. Griffin, tried to force through rule changes allowing non-white people to join the BNP. After widespread opposition from members, he was forced to abandon the proposals. However, the issue has come back to haunt him with a venegence with the selection of the grandson of an asylum seeker to fight a seat in next month's local elections. Sharif Abdel Gawad, whom the BNP describes as a "totally assimilated Greek-Armenian", has been chosen to stand in a Bradford ward as part of the BNP's biggest ever electoral push. "The decision has provoked a backlash among BNP hardliners who described Mr Gawad as an "ethnic" who should be barred from the party on race grounds. One regional organiser responsible for the candidate's selection is thought to be under pressure to resign. Another regional organiser is leading the dissent against the party leadership, saying it had betrayed the members and would confuse voters. On online noticeboards used by BNP supporters, scores of contributors denounced Mr Gawad's selection. They said the BNP should remain an all-white party and the decision to appoint him was taken over the heads of rank and file members." It is at times like these that people need to remember that, by-and-large, it is not the leader who defines the nature of a political party but the membership. It is possible for a leader to lead from the front and to work with the grain to achieve change over a period of time, and it is likely that as part of that process new members will arrive who will help to cement that transformation into place. However, when the leader is seeking to redefine the core values and principles on which the party was founded then the task is almost impossible. Thus, the BNP will always remain a racist party, whilst the Tories will always be a party built around self-interest and reaction. Each has their own electoral constituency but neither is relevant to the needs and interests of twenty-first Century Britain. 1826 - The Menai Suspension Bridge connecting the Isle of Anglesey to the north West coast of Wales was opened. The bridge was not the first suspension bridge, but was so hugely greater than anything previously built that it is considered the world's first modern suspension bridge. The total number of sheep in Wales must be something like 5.5 million. There are certainly more of them that there are people, although unlike the people they tend to be concentrated in the more rural areas for obvious reasons. With so many to choose from then, why embark on a project that will create two hundred life-size models of sheep to stand on a hillside alongside a real flock? Even as a community arts project it does seem a bit excessive, though I am sure it is very worthwhile! I return to one of the issues that has disappointed me. We have not had any words of welcome for the interim chair of the arts council, who is taking on a significant challenge. That is a great credit to him. He is someone of substance in the cultural community in Wales. There have also been some rather snide attacks on the interim chair, not in the Chamber, but outside, because he does not speak Welsh, and that is to be deplored. It is a shame that those comments have not been deplored elsewhere. There has been much snobbery and elitism in this debate over the arts over the last few months; there has been snobbery and elitism in the arts community and some of it has been directed at our Minister. It has been directed at him, at the end of the day, because some people do not believe that the son of a Rhondda miner should be a Minister for culture. That is what we have seen; we have seen disgraceful, elitist attacks on the Minister inside the Chamber and without. "It's incredulous that Leighton Andrews sought to turn the debate into a class-war. Claiming that the opposition parties couldn’t stomach a ‘son of a Rhondda miner’ as Culture Minister was beyond belief. The New Labour AM for the Rhondda is the Cameo Club class warrior. Alun Pugh’s bungling performance has nothing to do with his father did for a living. Perhaps WAG’s campaign to take the arts into communities could start with a tour starring Leighton Andrews and his synthetic indignation." "Bungle was the star of the children’s’ TV show Rainbow, but this Minister’s promotion and commitment to the arts and culture should extend beyond 80s television programmes. His bungling style does nothing to inspire confidence; Bungle belongs with Zippy and George not as a Ministerial style. Alun Pugh must buck his game up and provide the answers we all need. The Presiding Officer: I call Leighton Andrews. Obviously a fan of the show, the Presiding Officer closed up the zipper mid-sentence. The National Assembly agrees with the Statement of opinion tabled on 15 March (OPIN-2006-0026) in that it supports the future of Wrexham football club at the Racecourse ground. But the Assembly regrets the opinion is put down with the intention of promoting the Labour Candidate for Wrexham, the Labour MP and the Labour party instead of building a consensus to support the club and wonders exactly what work they have done in securing the future of the club. Next May's Assembly elections really could be interesting up North. The latest set of Assembly Parliamentary Statistics reports that in the last year 3.4 million words have been recorded as being spoken in Assembly Plenary and Committees. No wonder it is so warm in the Senedd. Kirsty Williams AM gave birth to a baby girl in the early hours of this morning. On the same day she launched a new website. Is this effective multi-tasking or just devotion to duty? A row that has been simmering under the surface has erupted into the columns of the Western Mail today with accusations that the Assembly is denying professional lobbyists the sort of access they had to Assembly Members prior to the move into the Senedd. As a member of the House Committee I have had letters from some of these lobbyists and have referred them to the Deputy Presiding Officer for consideration by the new Building Sub Committee. However, in essence the complaint is that prior to the move Assembly Members had to pass through a public milling area to get to the chamber. As a result lobbyists and members of the public were able to collar them to put their point of view. Under the new arrangements there are two possible routes to the chamber. Members can either walk through the public areas of the Senedd or they can take the more direct route down the back stairs into the Cwrt. Access to the Cwrt is limited to AMs, staff and the media. Given that most of us leave it to the last minute to get to the chamber due to other commitments we tend to use the less public area, although I and others have made an effort to walk through the public area when we can. Personally, I have more sympathy with the public than with the lobbyists, who will just have to work with the new arrangements. Assembly Members are still far more accessible than many other politicians and can be contacted here most days. We also continue to patronise events and receptions put on by groups in the Senedd and we will meet with most people who ask to talk to us. Marc Evans, who chairs the Chartered Institute of Public Relations in Wales, said, “I personally feel very strongly that public affairs specialists should not have privileged access to areas of the Assembly building that are not available to members of the public. “Apart from the question of physical access in the building, I am also concerned about the issue of public affairs consultants trading on their personal friendships with politicians. “Some people who work in the public affairs field used to work for political parties or perhaps are still political activists. Sometimes they are friendly with senior politicians. “It would be quite wrong if they tried to get business on the basis of such connections. There is a distinction to be drawn between giving advice to clients and seeking to profit from personal connections. It is not that I am trying to deal in stereotypes or anything but isn't this dragon-concept a bit overworked in marketing terms? Today's Western Mail carries this illustration of some of the dragon logos already in use throughout Wales. The one on the far right of the second row down is the new Wales brand logo. The Assembly Government logo is the one on the far right of the fourth row. The Assembly Parliamentary Service dragon is not featured at all. The Welsh media nearly experienced an unaccustomed level of openness and transparency this morning when somebody pressed the wrong button and the Plaid Cymru group meeting was broadcast around the Senedd. Members of her majesty's press had gathered in the media briefing room in the new building to hear Jane Davidson set out the Government's views on the issues of the day when all of a sudden they were startled out of their slumbers by the dulcet tones of Dai Lloyd AM announcing the start of the Plaid Cymru group over the loudspeakers. Naturally, they reached for their notebooks just in case something newsworthy might come from this broadcast whilst a Government Press Officer scurried around to warn the Plaid AMs that their deliberations were no longer confidential. The last words that were heard before the microphones were switched off were Dai Lloyd theatrically telling his fellow AMs that nobody had offered them any loans for peerages. Judging by this Guardian piece there must have been near-panic amongst the Labour spin doctors on Saturday at the prospect of a possible New Labour luvvie defecting to Cameron's Tories. A sense of humour has never been the defining characteristic of Labour's media monitoring unit. I know that Labour HQ visit this blog regularly but obviously they did not have time to do so before putting out their briefing in which the Guardian's April Fool joke was taken as fact. If they had then they would have seen from this item that there was nothing for them to worry about. Still, I enjoyed the joke, even if Labour didn't. As sure as night follows day the abolition of the WDA, WTB, ELWa and ACCAC took place today and all of their functions were absorbed into the Assembly Government. I have already discussed here and elsewhere the implications of this for scrutiny and transparency and also, in terms of the Welsh Development Agency and the Wales Tourist Board, how we are now to sell Wales to the outside world. Peter Hain's view on this is markedly different to the First Minister. He told the Western Mail last October that the WDA in particular was too good to lose: "This is a world-wide brand, the most successful development agency there has ever been. The Welsh Assembly Government needs to think long and hard before considering whether to ditch it." "The promotion of Wales externally is important and the Assembly Government has also been working on a new Wales brand to promote Wales overseas in a coherent way, to establish a consistent image of Wales which will motivate the world to buy what Wales has to offer; a brand that is as relevant to those promoting Wales as a tourist destination as to those promoting Wales as a business partner or as a place to study. The new Wales brand will be rolled out over the coming months, together with two adaptations for tourism and trade/invest." What Rhodri seems to be saying is that he wants to promote Wales as er... Wales, but he has not worked out how to do it yet. We will have to wait with baited breath to see what the 'new Wales brand' is exactly and whether it will meet the very high standards of the Secretary of State for Wales. Update: Apparently the new 'Wales brand' is based on a rehashed dragon. Not very original. Maybe they should have gone for something radically different and adopted a symbol which both encapsulates today's Wales and looks to the future - a Tardis perhaps. Like Alex Wilcock I am looking forward to the next series of Dr. Who, although I have a nasty suspicion that I may be away for episodes two and three. Must learn how to programme the video. Wales on Sunday is also getting excited about the forthcoming series. Like the Western Mail they must think that Christmas has come early. A major series written by a Welsh writer, produced by BBC Wales and filmed almost entirely in Wales has given them an opportunity to fill acres of space in their newspapers. With Russell T. Davies suggesting that the next Doctor may be a Welsh actor, it is possible that the blood pressure of the various journalists and editors may need serious attention. Amongst all of this anticipation the Wales on Sunday does have one interesting scoop. They report a conversation in which Russell T. Davies says that he is in no rush to work with glamour model, Jordan. "You open the papers sometimes and read how Jordan wants to be in Doctor Who and you think 'No chance' - bless her, but no way." But Davies does say he would cast Charlotte Church if she was interested. For goodness sake, this is a science fiction programme not a Welsh celebrity Who's Who. Still, Wales is back on the media map - for now! The eery thing about the Guardian's April Fool prank today is how plausible the whole scenario is. There is such a tight fit between the vacuity of Coldplay's music and the policy-lite agenda of Cameron's Conservatives that for a moment I thought they had goofed by pretending that the alliance between Chris Martin and the Tory leader was invented. "Coldplay's music shines with the kind of optimistic vision I want to bring to Britain as a whole," Mr Cameron said yesterday, at an impromptu press conference outside his local organic microbrewery. "And a forward-thinking party can't ignore the 'information superhighway'. So to anyone who cares about the future of this country, I say, look, let's not get bogged down in the old ideologies. Just click on to the world wide web, and listen to what Chris has to say." In the new lyric, on which the two men collaborated, Martin outlines some of his reasons for joining the Tories: Mr Cameron's habit of travelling by bicycle, and the way he dresses like members of Coldplay's fanbase, in casual clothes and trainers sourced, where possible, from Fairtrade outlets. "But it was the wind generator on his roof that clinched it," Martin said. "I realised that whatever Labour said about Kyoto, you were never going to see a windmill on the roof of No 10. Dave's given me an absolute assurance that he's committed to saving the planet." Martin once described Tony Blair as "brilliant," but yesterday the singer's trademark cheeriness faded when asked about the prime minister's performance in office. "I gave him one last chance," he said. "I invited him round to explain himself to me and a group of like-minded friends - about how he was going to make poverty history and all that. "But he never turned up. Madonna walked out, and Stella [McCartney] was totally gutted." In the new song, Martin rails at how recent events have "smashed my illusions about Tony Blair/His shoes, his suits, his terrible hair." In a subtle nod to Mr Cameron's reputation for voguish footwear he sings: "It was the converse trainers that did it for me/I got them in orange, wait till you see"
Mr Cameron hopes more British bands will follow where Coldplay has led the way, creating a Tory version of the socialist bands-for-Labour movement organised by Billy Bragg in the early 1990s. "I'm calling it Blue Wedge," he said. "Blue is back. I want all the top bands out there, from the Attic Monkeys to the Kaiser Chefs, to know they're welcome. There's absolutely nothing about my policies which anyone could object to." Personally, I am looking forward to the Ricky Gervais pro-Tory TV series, provisionally entitled The Central Office. As long as they don't get Hugh Grant to play David Cameron.